Congratulations to Jonathan Smith for winning the international health award, Tuberculosis Survival Prize, for his film They Go to Die. This award is given by the Tuberculosis Survival Project with support from the Lilly MDR-TB Partnership. View the press release here. Universities Allied for Essential Medicines and the Neglected Global Diseases Initiative invite you to a multimedia presentation on human rights, access to medicines, and global health innovation. Jonathan Smith, Director of the Visual Ethnography Project at Yale University, will be giving an exclusive preview of an in-progress documentary about families caught up in the southern African HIV/TB co-epidemic. He will be describing his field data collected as a part of his graduate research in epidemiology, showing documentary video from his field work, and hosting an open discussion on global health innovation. 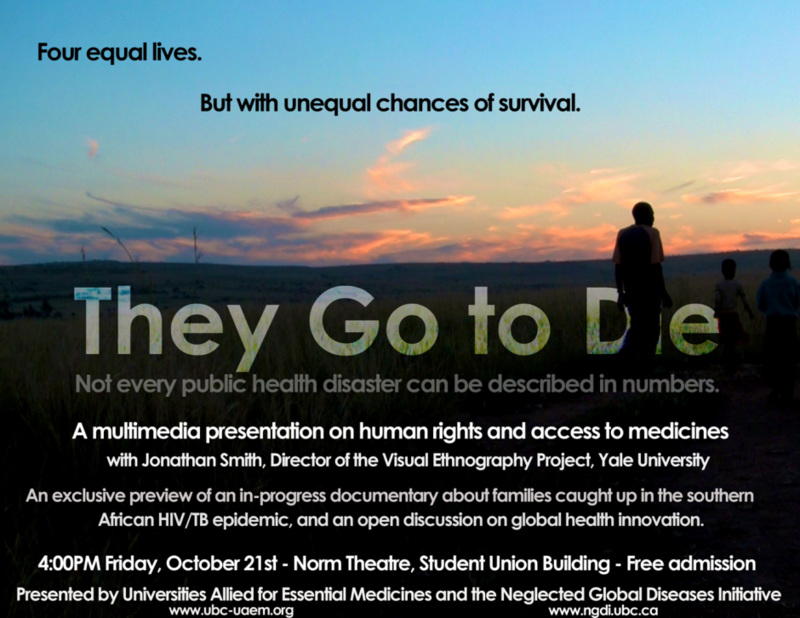 “They Go to Die” is a documentary film-in-progress that surfaces issues of health, human rights, and legal complexities of TB and HIV in the gold mining industry of South Africa nonlinearly though the context of life, love, and family. It follows four men that were sent home due to contracting TB in the mines and left with no access to medication. Though the men in the film that did not have access to care eventually succumbed to their illnesses and passed away, the film does not focus on their death, but rather the life that this process (termed ‘sending them home to die’) has taken away. The film tracks Jonathan Smith, a graduate American student as he goes where no one else has yet to go: into the homes of these men. As he travels to live with these African miners and their families, the film depicts bonding, cultural differences, and the challenges that each character faces in health and family life. They Go to Die is ultimately a story of humanity – a celebration of family and the power of relationships. As far back as 1903, South Africa’s Milner Commission Report stated that, “The extent to which miner’s [TB] prevails at the present time is so great, that preventative measures are an urgent necessity… and that such a large number of suffers in our midst is a matter of keen regret.” Skipping forward over a century, the Leon Commission Report states in 1996, “The failure to control TB in the mining industry is a matter of grave concern.” However, even with this historical narrative of public health outcry, in 2011 the South African Department of Health indicates that the South African mining industry has the highest rates of TB anywhere in the world by far: three times higher than the highest burdened countries. Because of this, new approaches to this topic must be looked at. The film is a real-life account of an American graduate student (Smith) as he learns of the devastating impact South African mining industry has on the TB/HIV epidemic, and the blatant human rights violations that these workers face. As he sorts through a century of documented research on the issue, he comes to the sober realization that any further research on the issue will fail to enact change. Thus he begins his quest to find the mineworkers affected by this process. Initially only driven by the data that highlights the importance of this issue, he travels to rural southern Africa to live ethnographically with four ex-miners and their families. However, once he embarks on this journey he quickly discovers that their lives are more complex than simply ‘numbers’ that fill the pages of an academic journal. As the film develops the never-before-seen lives of these miners, the viewer is made aware of the challenges that each miner faces in health and family life and witnesses Smith’s personal change as he overcomes cultural differences to create a personal bond with the men and their families. Despite this revolution, the film ends with the reality of the health situation of these men, and brings to life the gripping reality and importance of lack of access to essential medicines. Jonathan Smith filmed, edited, and is director of the documentary “They Go to Die”. He earned his Master’s of Public Health at Yale University with dual concentrations in Global Health Epidemiology and Epidemiology of Microbial Diseases. He has lived, worked, and researched ethnographically in a number of unique settings, ranging from obscure Andean Quechua villages to urban Jamaican slums. He is founder and director of the Visual Ethnography Project at Yale University. Due to his extensive work as an ethnographic researcher, he was awarded the Yale University GHLI Field Experience Award in 2010 and the distinguished Lowell S. Levin Award for Excellence in Global Health from Yale University in 2011.